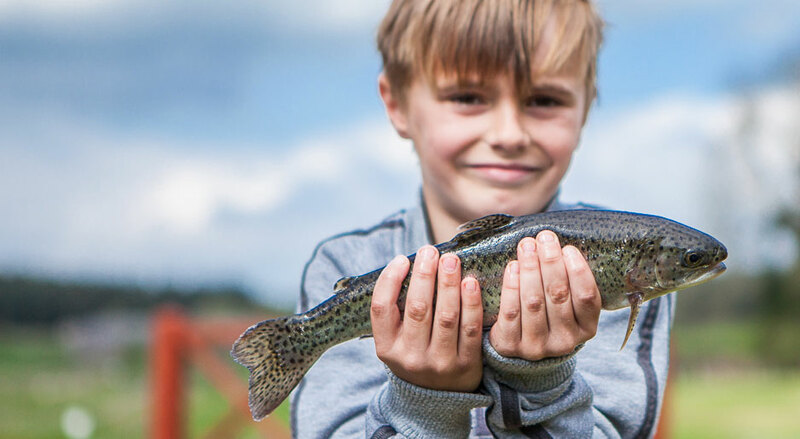 We have a selection of well stocked lakes suitable for all levels of fisherman – from family fun to the serious fisherman. Two trout pools stocked with Rainbow, Brown, Tiger and Gold Trout, up to 15lb. We also enjoy a natural stock of Rudd. Two coarse lakes stocked with Mirror and Common Carp to 15lb, Barbel, Tench, Bream, Roach, Rudd, Crucian Caru and Chub. We have a further worm fishing lake. 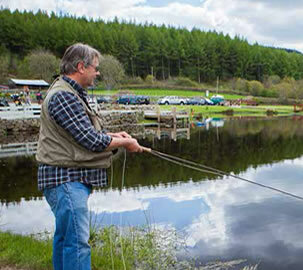 An intimate family pool offering an informal and fun introduction to fishing. Perfect on-site camping entertainment for kids. On-site tackle shop and tackle hire. Experience our own brand of wild camping then treat yourself with our free-range breakfast and fresh coffee in the morning. 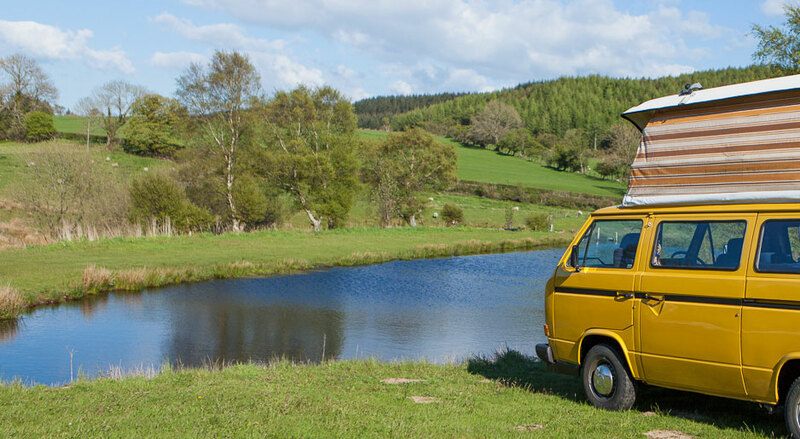 A relaxed ‘CL’ site for 5 touring vans or camper vans. Electric hookup and some stunning pitch locations. A recently refurbished cottage with great views and BBQ area. Our new B&B cottage sleeps 10 people in three rooms. Private outdoor eating area. 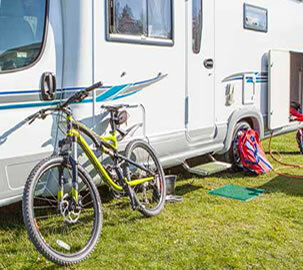 Safe, dry bike storage for all accommodation. We have added 2 new, 6 metre canvas bell tents to our site for some summer fun! We are proud of our cafe. 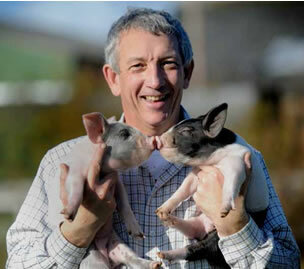 Since teaming up with Home Farm, Overton, we think we are offering one of the most truly ‘free range’ breakfasts in north Wales. 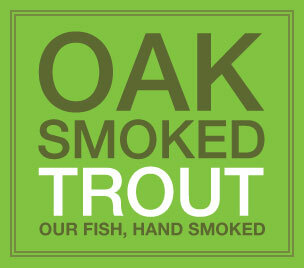 Of course, we also base some of our dishes around our own home grown fresh and smoked Trout. Combine great food with a healthy mix of fishermen, bikers, hikers and passing hungry folk. Oh, and our coffee’s not bad! 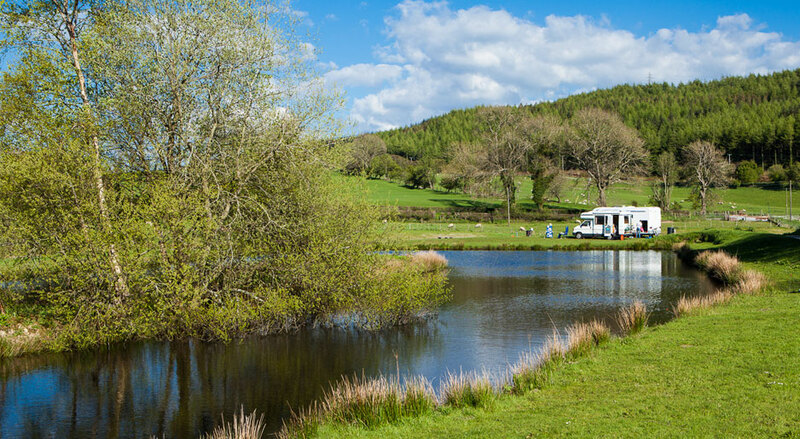 Llandegla Fishery is ideally situated for mountain biking and walking with a wealth of outdoor activities available within the magnificent environment of the Welsh hills. 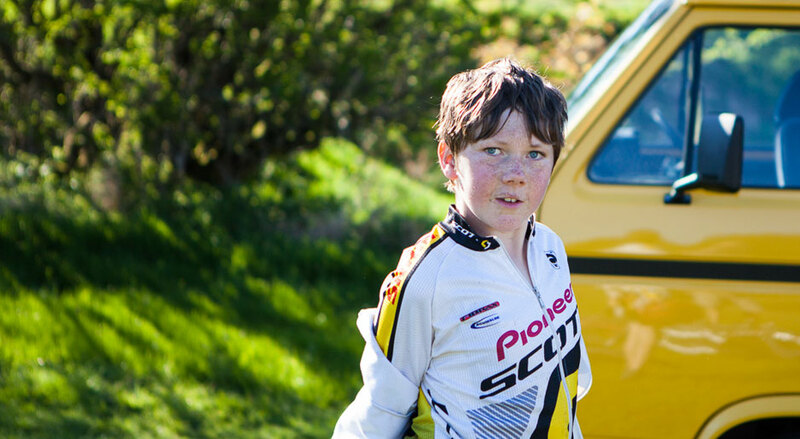 We are adjacent to one of the most popular mountain bike centres in the Wales (Coed Llandegla mountain bike centre’s entrance is 100 yards from our gate). There is also an RSPB centre within the forest and walks around the reservoir, home to black grouse. We are one mile away from Offa’s Dyke path. 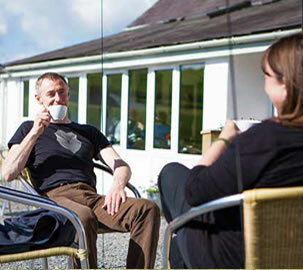 Llandegla shooting ground, gliding club and horse riding centre are all within a three mile radius. 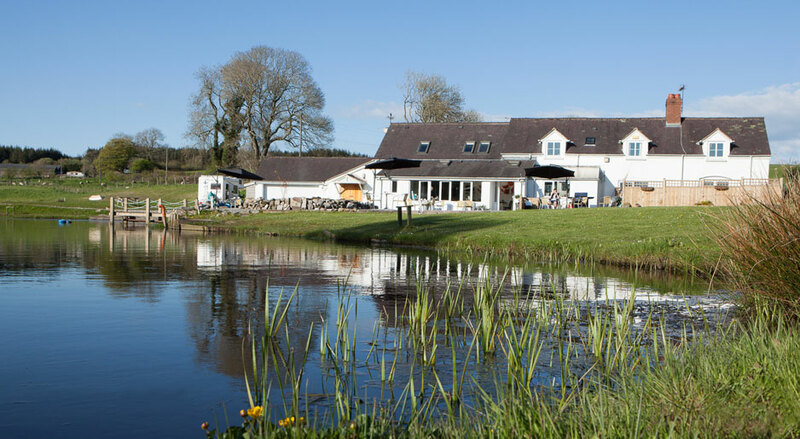 The family team at Llandegla Fishery aim to provide you with a warm welcome in a relaxed atmosphere. Imagine staying in a luxury cottage with great views, a five minute cycle ride to the trail head at Coed Llandegla Mountain Bike Centre, with wild moorland walks from the door step. 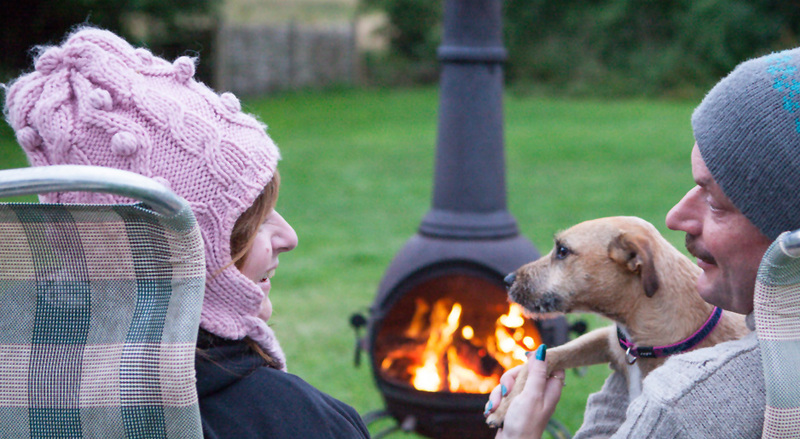 Compliment your outdoor adventure with a lovely holiday cottage to roll home into. We have counted 26 Canada geese chicks being raised naturally in our lakes this season.